14 July 2007 (Jakarta Post) – 18th century artefacts from Indonesia’s Dutch colonial have been destroyed due to construction work in the Old Town area of Jakarta. Excavation during the construction of a pedestrian tunnel in Old Town, West Jakarta, has destroyed artifacts and hampered historical analysis, an archaeologist said Thursday. “The cultural and museum agency should have been informed about the excavation at the Old Town site… a permit should have been sought before the project began,” University of Indonesia professor of archaeology Mundardjito said. “Digging beneath a historical site without an excavation permit is illegal,” he said. Late last year, workers who were excavating at the Old Town site — to make way for a western entrance to the pedestrian tunnel in front of Bank Mandiri Museum — found an old tram track, timber poles, terra-cotta pipes and a thick brick and andesite wall. A preliminary analysis carried out by the agency’s archaeological team revealed the wall position did not match that of the old city wall. 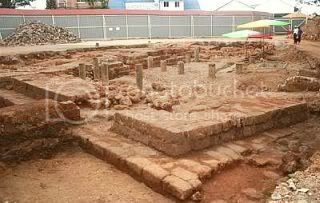 Read more about the excavations at Old Town. 12 December 2006 (Jakarta Post) – An underground wall has been uncovered in Jakarta, but the lack of legislative support and urban construction concerns mean prevent further archaeological investigation. The discovery of an underground structure in a historic area of West Jakarta is only the beginning of the process of studying and understanding the site, experts say. Last month, workers digging the western entrance of a pedestrian tunnel in the Old Town area uncovered the remnants of a stone wall, buried some three meters under the earth. “The wall is likely to stretch farther along the north-south axis,” Josia Irwan Rastandi, a structural advisor to the contractor building the tunnel, Wijaya Karya, said last week. The ongoing construction project makes it unlikely the city administration will permit a thorough on-site investigation, but archaeologists may be able to examine the ruins from another vantage point. The stone structure, which stretches along a straight north-south axis, is intercepted by a 160-centimeter-thick brick wall, running east-west. Heritage activists previously called for the construction project to be halted, in the belief that the findings were part of the Batavia city wall, which was built in the early 1600s.